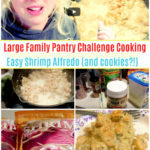 Whoohoo, this large family cooking video is during week three of my current large family freezer and pantry challenge! I cooked up 4 lbs of homemade easy Shrimp Alfredo in the dutch oven. The kids had it over brown rice from the Instant Pot and I had it over cauliflower rice. Also, digging deep in the pantry staples, I whipped up about 4 dozen homemade oatmeal walnut cookies for the kids to take as part of their lunches to homeschool group the next day. I publically embarrass myself while cooking the shrimp in today’s video because I didn’t think to defrost them first. Several YouTube viewers reminded me in the comments I can quickly defrost shrimp using the cold water defrost method. This defrosts the shrimp in about 5 minutes simply by running cold water over them. But alas, I’m just a mom trying to cook up enough food quickly for my hungry army of people who look just like me :). I didn’t give a moments notice to quickly defrosting the shrimp. So note to you, defrost your shrimp quickly first. Then you won’t have to drain the extra water build up in your pot as I did (I could’ve also let the shrimp and liquid reduce down but this goes along with my point of momma was rushing to feed these kids, ha!). 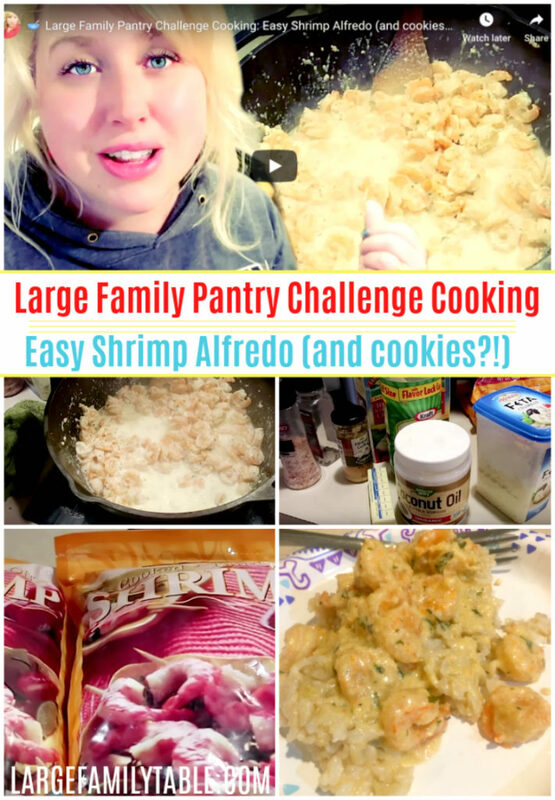 Easy Shrimp Alfredo Recipe ~ Your family will enjoy this easy Shrimp Alfredo recipe! I whipped it up with items I had on hand during my recent large family pantry and freezer challenge. Add 1 stick of butter and 4 lbs of defrosted pre-cooked shrimp to dutch oven or large pot on medium heat. Stir well and add in remaining ingredients listed above. Cover again with lid and let simmer an additional 5-7 minutes until sauce is thicker and Shrimp Alfredo is hot and bubbly. Serve over hot brown rice, noodles, cauliflower rice, zucchini noodles, or your other favs!